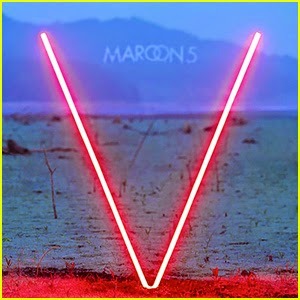 Having declined to record for Maroon 5's previous album, keyboardist Jesse Carmichael rejoined Adam Levine and company to put out the band's fifth studio record, V.
He might as well have stayed home. The keyboard and synth work on this album sounds like it could have been put together by any casual GarageBand user - and this is not close to the biggest problem with this album. Adam Levine hasn't been a credible album artist for a few years now, as his inability to reproduce his songs at original key live suggests. This album does nothing to dispel such an assertion. By and large, Levine sleepwalks through this album, putting out vocal line after bland vocal line - and when he does try to reach high, it sounds whiny and painful (as heard in songs like 'Animal', 'New Love' and 'Sugar'). Also: Auto-Tune. The band cannot even rely on the idea that they roped in guitarist James Valentine way back in 2001 to steer them towards a new musical direction; there is nothing to suggest that when joining the band, Valentine, a legitimate jazz and rock musician, had in mind playing the same few chords every song only to be shunted to the back end of the mix to accommodate annoying electronic beats and Levine's awful nasal screeches. Dare I say this, then: the band has made so much money over its time in the spotlight that its members have long stopped putting effort and thought into making their music. The one song on V with any musical value, 'Feelings', is duly ruined by Levine's misguided forays into vocal ranges far too high for him in the previous decade, let alone now. The collaboration piece with Gwen Stefani does the album no favours either. This is the latest episode in a steep and sudden decline that began in 2010 with the disappointing "Hands All Over" album. The days of "Songs About Jane" are well and truly gone, only to be taken over by the same soulless drivel this band appeared to set itself apart from all those years back.